Fr Manuel Barbiero SSS (right) with Australian pilgrims at Notre-Dame de Fourvière, Lyon, October 2011. Follow these links to read about the personal experiences of individuals and groups of pilgrims who have travelled to the Eymardian places in France. To recall the 150th anniversary of Eymard’s death, in July 2018 Fr Manuel Barbiero SSS led a pilgrimage following the path of Eymard during the last days of his life. Marie-Therese Joubert writes about the pilgrims’ visits to the Adoration Chapel in Grenoble, the Shrine of Our Lady of La Salette, and La Mure, SSS Congretatio, 14 August 2018. Article by Fr Martin Ochola SSS, reporting the journey of eighteen pilgrims in June 2017 to Eymardian places at La Seyne-sur-Mer, Toulon, and Aix-en-Provence, SSS Congretatio, 14 September 2017. Article by Fr Raphael O’Halloran SSS, reporting a week-long Eymardian pilgrimage undertaken in April 2016 by a group of eight people from the Blessed Sacrament Chapel in Dublin, Ireland. Published on the Congregation of the Blessed Sacrament international website (sssinternational.net) on 5 July 2016. Article by Fr Leopoldo Cristinelli SSS, reporting a six-day pilgrimage in August 2014 by a group of friends (‘Group St Peter Julian’) to a number of places associated with the contemporary church and Eymardian places including La Mure, Lyon, Fourvière, Ars and La Salette. Published on the Congregation of the Blessed Sacrament international website, 14 October 2014. Article by Brigitte Cassard, reporting a pilgrimage undertaken by eighteen people on 5-7 May 2014, visiting Eymardian places in Lyon, Monteynard and St-Bonnet-le-Froid. Published on the Congregation of the Blessed Sacrament international website, 6 August 2014. 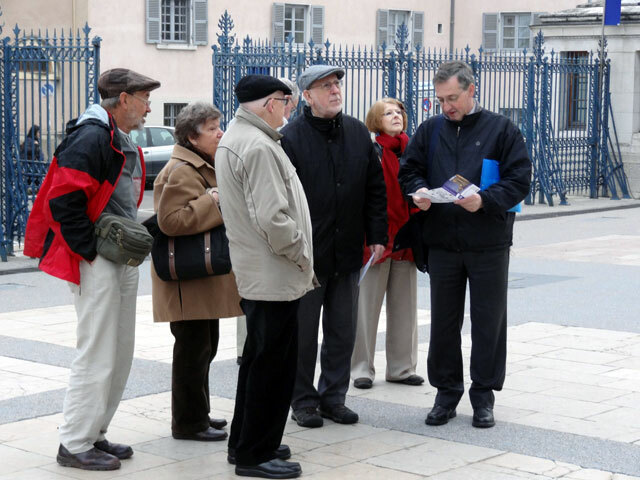 Report by pilgrim Yolaine Couder of a two-day pilgrimage to the Eymardian Places in Paris held on 27-28 March 2014, involving eight pilgrims from the parish of St Peter Julian Eymard at La Mure, their parish priest Fr Armand Silaho Moudilou SSS, and guide Fr André Guitton SSS. Published in SSS International magazine (Rome: SSS Generalate), n. 230, 20 May 2014. Report by Sr Teresa Dinh Anh Dao SSS of a week-long pilgrimage by six Vietnamese nuns in September 2013, travelling from Paris to Grenoble, La Mure, Notre-Dame du Laus, Notre-Dame de La Salette and Ars. Published in SSS International magazine (Rome: SSS Generalate), n. 226, 20 December 2013, pp. 1-2. Report by Fr Vergel Dalangin SSS of a pilgrimage held on the feast day of St Peter Julian Eymard, 2 August 2013, involving seventeen people who hiked on foot from Chapelle St Pierre-Julien Eymard at La Mure to the shrine of Notre-Dame de La Salette. Published on the Congregation of the Blessed Sacrament international website (www.sssinternational.net), 8 August 2013. In the footsteps of St Peter Julian Eymard Article by Christine Heffernan with Damien Cash, reporting the Australian pilgrimage to the Eymardian Places in France held in April 2013, published in Kairos, vol. 24, issue 12, 7 July 2013, p. 26. Report of the Australian pilgrimage to the Eymardian Places in France held in October 2011, published in The Vineyard (special edition), Blessed Sacrament Congregation Province of the Holy Spirit (Australia), December 2011, pp. 1-16. Report by Br Bernard Canty SSS of the Australian pilgrimage to the Eymardian Places in France held in October 2011, published in The Vineyard, Blessed Sacrament Congregation Province of the Holy Spirit (Australia), February 2012, pp. 3-4. Report of a pilgrimage to France on the occasion of the 200th anniversary of the birth and baptism of St Peter Julian Eymard held in April 2011, published in Bread, Broken & Shared (Province of St Ann Newsletter), Congregation of the Blessed Sacrament (USA) Province of St Ann, Sep-Oct 2011, pp. 12-14. Report by Br John Christman SSS of a pilgrimage in 2010 by Blessed Sacrament Congregation scholastics to the Eymardian places in France, published in Vocation News, Congregation of the Blessed Sacrament (USA) Province of St Ann, January 2011, pp. 1-2. Report by John Kingston of his pilgrimage to Eymardian places in the vicinity of La Mure, France in December 2007 and January 2008, published in The Vineyard, Blessed Sacrament Congregation Province of the Holy Spirit (Australia), July 2008, pp. 2-4. Report by Dr Patrick J. Riley of a pilgrimage to the Eymardian places in France held in September 2004, published in the Province of St Ann Newsletter, Congregation of the Blessed Sacrament (USA) Province of St Ann, November-December 2004, pp. 1, 6-7.